Although this discipline was formally initiated in Mexico is only about 25 years ago, it really began in the gardens of Chapultepec hundreds of years ago by the tlatoanis, the collective name for the villages where Náhuatl, the ancient language of the Aztecs, was spoken. There are of course the famous floating gardens of Xochimilco, (founded in A.D. 919 and meaning “flower field” in Náhuatl), which today are the remnants of amazing and sophisticated agricultural complex in lake Texcoco, where the City of Mexico was originally founded. The name Xochimilco refers to the many flowers and other crops that were grown here on chinampas prior to the arrival of the Spaniards. The system developed by the Xochimilcas greatly increased production of staple crops such as corn, beans, chilies, and squash. As an aside, Xochimilco had a woman ruler, the only pre-Hispanic one in Mesoamerica. She added a number of distinctive dishes to the area’s cuisine such as atole with chili pepper. Many of postcolonial features of landscape architecture in Mexico originated in Spain, and the Spanish origin of these features actually come from the Arabs or Moors who ruled Spain for approximately 800 years (until 1492, when Spain fell to Catholic reign of Ferdinand and Isabella). These include the classic plaza layout seen in almost every Mexican village, often centered around a fountain or gazebo, landscaped with shade and fruit trees. The classic but modest Moorish fountain, which can be found throughout southern Spain, gurgles slowly and quietly rather than the gushing version seen in the U.S. (although in Mexico it seems that only one in five is working; they are not maintenance-free). Paseo de la Alameda, or Alameda Central, founded in Mexico City the 16th century by the l Virrey Luis de Velasco, was the first public park created in the Americas. This was followed by construction and landscaping of La Avenida Bucareli, in 1778, previously known as Paseo de Bucareli and Paseo Nuevo, in an effort to modernize Mexico City and create an attractive and enticing avenue lined with trees and fountains. In 1833 the Mexican Society of Geography and Statistics was founded, initialing the first cartographic exercise in the Americas, a major milestone. Between 1935 and 1939 thirty-six national parks were established, and followed by the establishment and enlargement of 34 parks in Mexico City. The parks, in combination with the planting of trees along city avenues and boulevards, changed the look and feel of Mexico City. One of the most influential people of the time, Miguel Ángel de Quevedo (September 27, 1862 – July 15, 1946), was a Mexican architect, engineer, and ‘environmentalist’ who founded Mexico City’s vivero (plant nursery) at the Coyoacan arboretum, and completed numerous other construction projects in the city and throughout the country. He was a pioneer and major supporter of conservation of Mexico’s forests, often unappreciated by farmers and the timber industry. 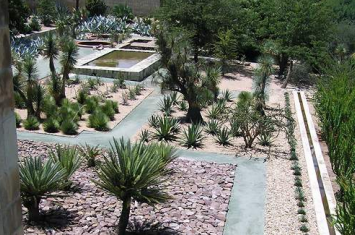 Today Landscape Architecture is offered at UNAM (Universidad Autonomo de Mexico), which was founded 104 years ago. The professional Society of Landscape Architects meet biennially and will hold their next conference in Mexico City, June 10 and 11, 2014. Unlike in the U.S. and Canada, irrigation systems do not appear to be a major focus of study and the program offered at UNAM focuses on design and construction. In Spanish the word pais means county, while paisaje means landscape, the origin of which is the Latin word pagus (the smallest administrative district of a province). Thus the landscape is innately tied to the country, as in ‘land’ and landscape. In addition to the old world influence, contemporary landscape architecture has a large North American influence. Several well known Mexican Landscape Architects include, Mario Schjetnan whose attempts to “unite social concerns, aesthetics and, increasingly, ecology- all by way of interpreting and celebrating Mexico’s rich and diverse culture.” Another very well known architect/landscape architect is Luis Ramiro Barragán Morfín, one of the most influential people of his time and genre in modern Mexico. His first projects were carried out in his native Guadalajara but by 1931 his work expanded to other parts of Mexico. One of my favorite gardens in the world is the ethno-botanical garden behind the Church of Santo Domingo in Oaxaca City. The beautifully laid out garden consists of only native plants that have a cultural use (edible, medicinal). Using a combination of vegetation, well-placed trails, and textures and colors provided by an assortment of gravel, sand, and stone, the garden is enticing and attractive at all times of the day. Another well known garden can be found behind the Museo Dolores Olmedo Patiño, Xochimilco, Mexico City.